There’s nothing new about the fact that the consumer’s path to purchase has been changed forever. If you’re reading this article , then you already know that mobile is vital, social media is the new word of mouth, content is king, and video has invaded every part of digital life. However, understanding the new path to purchase means a good deal more than that, or rather, there’s deeper details that can radically change the way you view the role of your marketing in the path to purchase. The last gasp of the linear path to purchase was declared dead in mid-2015, giving way to what Google aptly named micro-moments. Yet the transformation of micro-moments hasn’t slowed, and they are, in fact, the key to truly understanding the new path to purchase. Micro-moments aren’t just important — they’re the new battleground, where your brand will shine or be missed entirely. The term micro-moment isn’t hyperbolic, either. Your brand has exactly one moment to be where the consumer is looking to meet their need, and 87% of these moments occur through mobile devices. This has drastically altered the way you need to approach customers, and has also altered the way you understand your customers to begin with. Demographics are important, but purchase behaviors and intent are essential. To be sure, demographics cannot and should not be eliminated from market research and segmentation. But all the demographics in the world aren’t going to mean anything if you fail to understand that the intent of the consumer matters far more than their identity. The immediacy of their need or desire literally leaves them reaching for their mobile device, looking for information or even looking to purchase. Mobile-only purchases are now pervasive, even in markets that didn’t used to have a mobile market, to the point that 1 in 6 consumers who bought a vehicle via a mobile device never used another media device. Roughly 25% of users doing research for big ticket items from a mobile device are wanting to convert as soon as possible. Consumers doing mobile research on the go are twice as likely to make a purchase within an hour as well as more likely to convert in store. 44% of consumers consider mobile devices to be the single most indispensable tool for purchasing decisions. 50% of consumers that want to make a physical purchase within an hour expect to travel no more than five miles to fulfill that purchase. 60% of consumers that use their mobile device to do research in-store will make a purchase at the physical location. It can be easy to assume that, in a byte sized world available 24-7 wherein need tops loyalty and immediacy seems to beat all else (i.e., the internet), you don’t need to worry about content as much. But the truth is, content has always mattered, and probably always will. While this is bolstered by your customer testimonials and reviews, it can’t be dependent on them, or it can’t be competitive. Yes, that’s in part because of how Google determines SEO rankings, but, as ever, it’s because this is how you engender the relationship with your customers that leads to repeat sales. It’s also important to remember that the way you use content to connect with your customers isn’t limited to your website content. To be sure, blog posts and similar content are vital to positioning your business as a valuable resource, whether it’s among other businesses in your industry or with your customers. However, consider the content that can be attached to tools such as coupons, e.g., coupons for kitchen products or food can include recipes for quick, healthy dinners or snacks, or even tips on how to throw a small office party. Even catalog content can offer a new opportunity to share information, whether you put similar tips and tricks alongside product listings or feature QR codes that allow customers to access video (e.g., even recordings from past offline events, unboxing, or how-to videos), blog entries, or reviews. You can even utilize content that’s normally relegated to online mediums in-store, presenting reviews alongside promoted products or even offering key videos at interactive kiosks, giving customers the choice to watch how-to videos before purchase or videos from related events. Content is how you develop your brand as a leader in your industry. You already know this, but it behooves us to point out how important it is that this hasn’t changed. You’re undoubtedly familiar with Yelp, Angie’s List, and Amazon, and you may have even heard about the internet famous Peeple, so you already know about the power of consumer reviews. For instance, it’s well known that customers trust and prefer consumer reviews over manufacturer or retail data (by as much as 12 times) and 70% of customers rely on them in their research process before purchase. You may not, however, understand just how much of an impact they really have. Reviews lift your SERP rankings, not only because they qualify as fresh, qualitative content, but because some 64% of consumers are actually searching for them specifically. What’s more, on SERP pages that include a shopping results section (Image, price, and link) often also include a star rating, which helps your product stand out and even produce as much as a 20% increase in click-through rates. Of course, SEO isn’t the only thing lifted. Conversion, average order price, and returning customer rates see a collective 18% lift, and customers who interact with reviews and similar content (e.g., customer Q&As) are 105% more likely to make a purchase during the visit to your site. Also, for as much as too many bad reviews will invariably hurt your brand, having all good reviews isn’t actually good either — consumers are much less likely to trust your brand or product without them, and bad reviews will actually lift conversions by 67%. It’s no secret that as devices, televisions are the only platform declining by double digits worldwide and across all ages. Yet the days of video are far from dead — in fact, while TV is dropping, mobile devices are gaining ground, albeit slowly. That means all kinds of video fit into the micro-moments structure. Not only did video make up an astounding 69% of internet traffic, consumers spent more than 5 hours per day watching digital video on average, including long-form video. Nearly 40 minutes of that time is spent watching video from a mobile device. Furthermore, 84% of consumers like branded videos in their social feeds, which undoubtedly explains why 87% of businesses see digital video marketing as successful and effective. Plus, 64% of consumers are more likely to make a purchase about particular products after watching videos about them, and videos on landing pages increase conversions by 80%. Don’t make the mistake of presuming that all of these videos are excessively short, either — 36% of mobile users will watch video that’s more than five minutes in length. That’s because what customers want is quality. Whether the video is long or short doesn’t matter as long as it fits their need in the moment, something that’s even easier to see when you consider the fact that searches for how-to videos on YouTube jumped by 70% over 2015. 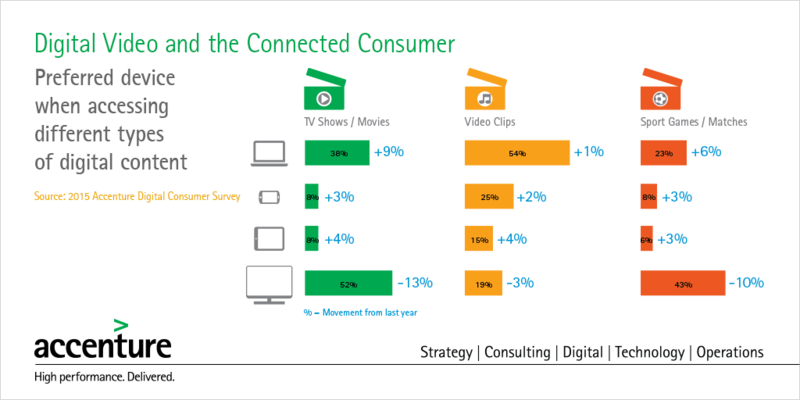 Here, again, mobile takes the lead, because 91% of smartphone users are turning to their devices to find these videos. According to Google, some 100 million hours of how-to YouTube videos had been watched in Q1 of 2015. Whether you’re talking advertising or content, video isn’t something your brand can afford to ignore. That’s true for the B2B sector as well. More than 65% of executives went to a vendor website after watching a video, and another 39% called. Another 59% of executives prefer video explanations over reading text, even on the same page. That’s because concepts are easier to share and easier to mentally digest through video, even if what you’re discussing isn’t something as straightforward or hands on as a video tutorial. While only 14% of consumers trust advertising on social media, 93% say their decisions are influenced by social media. E-commerce orders influenced by social media averaged about $145. Yet whether you love it or hate it, social media is even more ingrained in the consumer journey than ever. This is because, by its very nature, social media hits so many of the most important moments and micro-moments along the way. Customers turn to social media for reviews, share potential purchases with peers for input, share their joys or vent frustrations, and seek out customer service, all of which, in its turn, affects other customers at other points in their consumer journeys. This, of course, is a potential gold mine for your brand to take advantage of micro-moments. The consumer journey has definitively changed, but in some ways, some things have stayed the same in an intensely abbreviated and wholly digital form. By understanding the new path to purchase, you should be able to effectively transform your marketing tactics (or more) to better serve your customers as a “moments ready” business.